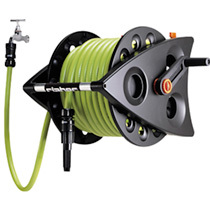 A sturdy, removable wall-mounted hose reel kit, for all your garden's watering needs. Comprises robust dispenser reel of twin-wall braided thru-flow hose to allow you to use the hose without unrolling the whole reel, 1.8cm (¾") threaded tap connector and 1.25cm (½") reducer, four automatic couplings and an adjustable spray nozzle. Requires some home assembly. Available in a choice of two hose lengths - 15m (49') - no wall brackets included or 30m (98') - two wall brackets included. The hose reel can be used with a pressure washer. The pipe has a 24 bar burst threshold (348 psi). Recommend attaching hose reel to pressure washer not the pressure washer to the hose. The pipe is PVC. The reel doesn’t come with a tap extension, it does come with the hose connectors to make one up. So the customer has to cut off the required length from reel to tap. No need to unroll the hose!